Earlier this week, Chuck Wendig, author of the upcoming Star Wars: Aftermath, wrote a post about his writing process and challenged other writers to share theirs, so I thought that would make a perfect post for this week. I'm the sort of writer who works really well with a consistent routine and something to always work on. My routine has been something I've slowly been coming to over the years and I really like where I'm at because it's allowed me to create a tremendous and, I think, quality output. Though I used to be the exact opposite, I'm an early riser and do my best to get to my local coffee shop or my office by 6:00 am. At that time in the morning, there is no one trying to send me emails, no one calling or texting, the kids aren't awake, and I'm left with nothing but my thoughts. Lately, I walk to the coffee shop as often as possible. It gives me time to collect my thoughts. Then, I sit down with my writing notebook and journal for a little while. Using one of my two fountain pens, Herugrim or Kusanagi, I'll write two or three pages in my Moleskine notebook to get my mind started with the act of putting down words. Sometimes I'll write about my dreams from the night prior, sometimes it's about a movie or a story that affected me in the last couple of days, sometimes it's literal journaling of life-changing events that have happened, and sometimes it's just me stressing out about how much work I'm not getting done. That's Kusanagi pictured there, Herugrim currently needs an ink refill. 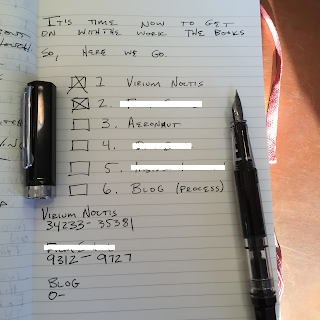 Virium Noctis is the super-lame and pretentious working title of the fantasy novel I'm working on and that's always the first thing on my list. I give my first thousand words or so of the day to my novel. I feel like the first thousand words I have to give are my best and most important, so I always give those to myself. Then the next thing is a book proposal I'm working on. After that is revisions on The Aeronaut (which might still be killing me.) The pages giving me the most trouble have been printed out and I keep them in a large manila envelope in my bag and I make notes on them whenever and wherever I can. There are more projects on there and they're all important and all on various deadlines that I can't talk about yet. Obviously my blog, which is the lowest priority (sorry), is here. And as I wrote this, I forgot that writing my pub quiz (the one I host - Wednesday nights at Lucky 13 in Salt Lake City!) needs to be the seventh item on my list. I've added it now, but I'm not re-uploading a photo. As I write things, I keep track of what my daily word count is, as well as my monthly word count, and the word count for each of my notebooks. (It takes me about two months to fill one of these moleskines.) This lets me know if I need to pick up my pace and lets me know if I'm hitting my goals. On days where I have to go to my day job (since I'm not selling enough books yet to be solely a full time writer), I'm out of the coffee shop and at work by 8:00 am. When I get off work, I'll finish whatever else I have left on my list with whatever energy I have left, which is why I usually leave the lower-priority stuff for later. On weekends, I'll go write until the kids want to have breakfast. Since my kids aren't morning people, that might extend my hours until noon. On good days I'll have my daily goals hit and the rest of the day is spent dedicated to family and friends. I write in Apple Pages. I found that it works for me very easily and it's a great program for layout and can export straight to Word for submitting to editors and ePub for stuff I might decide to publish myself. I bashed my head against the wall trying to use Microsoft Word for a long time and I just decided I hate it. I use Final Draft for screenwriting as well. I keep my outlines and story notes in two different places: First, there are many hand written in my notebook (so I can keep them portable and easily refer to them). Second: I'll create the outline in the Pages document I'm working in, chapter by chapter, scene by scene. I tend to do a very broad overall outline, and then very detailed outlines for the next few chapters at all times. This is something that's worked well for me, but, like any piece of writing process, your mileage may vary. As I finish a draft, I save it and leave it preserved in amber. I save every iteration of my stories in case I need to go back or a hundred years from now professors will be teaching my oeuvre and will wish to use my drafts as examples, they'll have it. All of my documents have a version number on them. So right now, Virium Noctis has a file name "Virium_Noctis_rough." The Aeronaut is currently "Aeronaut_v7." And I've kept everything in between for all of them. Sometimes I'll find that I cut a scene from my rough and then in the third draft I find I still need a piece of it, so I'll be able to refer to it or even copy and paste it. I try to read a lot about the processes of other writers, too, and incorporate what I can into my writing. And I'll try to even write a whole book from their perspective. Right after I read Stephen King's On Writing, I wrote a whole book using his method. It turned into a really fascinating book (that you might get to read next year) but I only incorporated pieces of that process into my next book. That's generally my process. I'll leave my emails and business kind of stuff for the middle of the day when my brain doesn't need to be so focused. But if you catch me tweeting between 6 and 8 AM (MST) any given morning, tell me to close my browser and get back to work. Speaking of my work: I had a piece come out for Salt Lake's Alt-Weekly, City Weekly, and it's about how a Dungeons & Dragons could actually be rad. You can read it here, please do, and spread that link to anyone who might be interested. As a reminder, here's a list of "rules and guidelines" I've been collecting over my years of studying writing advice and process. There are links to dozens of essays I've written about each individual bullet point and I think some people find it helpful. That's it for this week. Sometime this week I'll post my Dragon Con schedule. As far as my work outside of all this: I'm keeping busy for Big Shiny Robot! and Full of Sith. As a reminder, you can get tickets to Stuff You Missed in History Class's first live episode in New York in October (which, coincidentally, will feature me) right here. The Importance of Staying Focused.